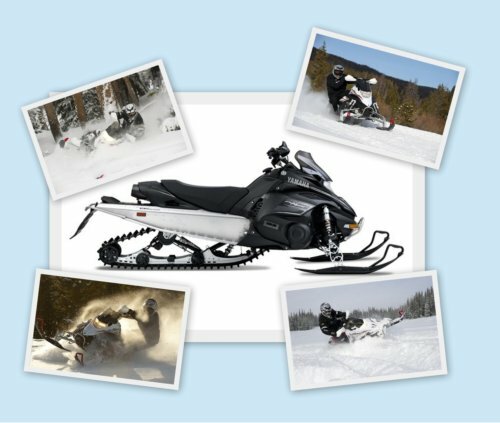 Snowmobile Rental Discount - Yamaha XTX Snowmobile! Rent the best of the best with a big discount! To get this group rate deal we need to sell 75 packages by December 10th 2012. If not enough people sign up, then the deal is cancelled, and you will be refunded. Better luck next time! So if you really want the rental Group coupon, spread the word. The first available rental date is December 20th, 2012 unless we meet our goal earlier. The XTX group coupon is valid until May 15th 2014. Reservations are a first schedule first serve basis so make sure you lock out your desired date(s). With Central Oregon's snowfall we usually have a 6 month season for safe snow in the high country. Only one coupon allowed per customer per business day unless otherwised scheduled. Call 541-306-6197 for any questions you might have. Not your normal run of the mill rental sled, the XTX is one serious versatile machine. The Yamaha Nytro XTX offers the best of all worlds for trail handling, bump-bridging and off-trail flotation. The XTX accomplishes all three goals with ease. It rides groomed trails like a sport sled. It bridges trail chop like the extended track model, and it affords added traction and deep snow flotation for off-trail adventuring. With its strong power and incredible suspension tunability, the Yamaha XTX is all things to just about all serious snowmobilers. We look forward to serving your rental needs. To get this group rate deal we need to sell 50 packages by March 5, 2012. If not enough people sign up, then the deal is cancelled, and you will be refunded. Better luck next time! So if you really want the rental Group coupon, spread the word. The first available rental date depends on weather. As soon as the weather is warm enough to de-winterize our boats it's time to play. The ski boat group coupon is valid until Oct 10, 2013 allowing for 2 full seasons to reserve your date from March - October each year. Reservations are on a first schedule first serve basis so make sure you lock out your desired date(s). Only one coupon allowed per customer per business day unless scheduled in advance. Call 541-306-6197 with any questions you might have. Our ski boats come equipped with a powerful Volvo Penta. These engines are fuel efficient 4.3 liter V6 motors with plenty of power for waterskiing, wakeboarding, knee boarding, tubing, or just cruising the reservoir or local lake. With a maximum capacity of 7 persons or 1050 lbs. 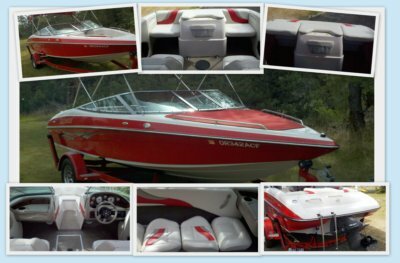 and plenty of storage with spacious seating, your day on the water is bound to be comfortable and filled with fun. For some time in the breeze, open the walkthrough window and access the open bow of the boat. Close it up for after you get your fill and enjoy some quiet cruising. Getting in and out of the water is a breeze with the molded swim deck and telescoping ladder system. 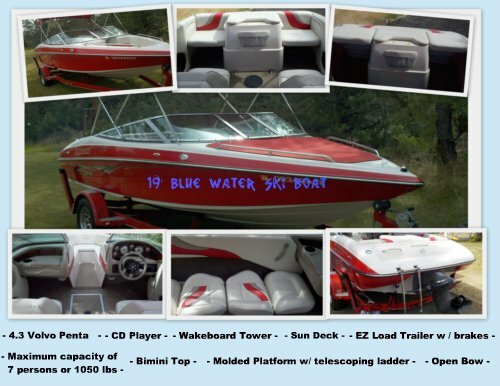 All of our ski boats feature CD players and a nice interior design. The rear seats are removable to allow for more cargo space or for turning into a sun deck for lounging and relaxation. The interior back to back seats recline and slide flat, maybe for that evening on the water under the stars. We look forward to serving your rental needs and making your visit to Bend, Oregon a memorable one.